Happy Friday! For me, it was a bit slim pickings on the carpet scene but there were some great looks. My top pick is Brie Larson, followed by Cardi B and Karlie Kloss. Who takes the top spot on your list? 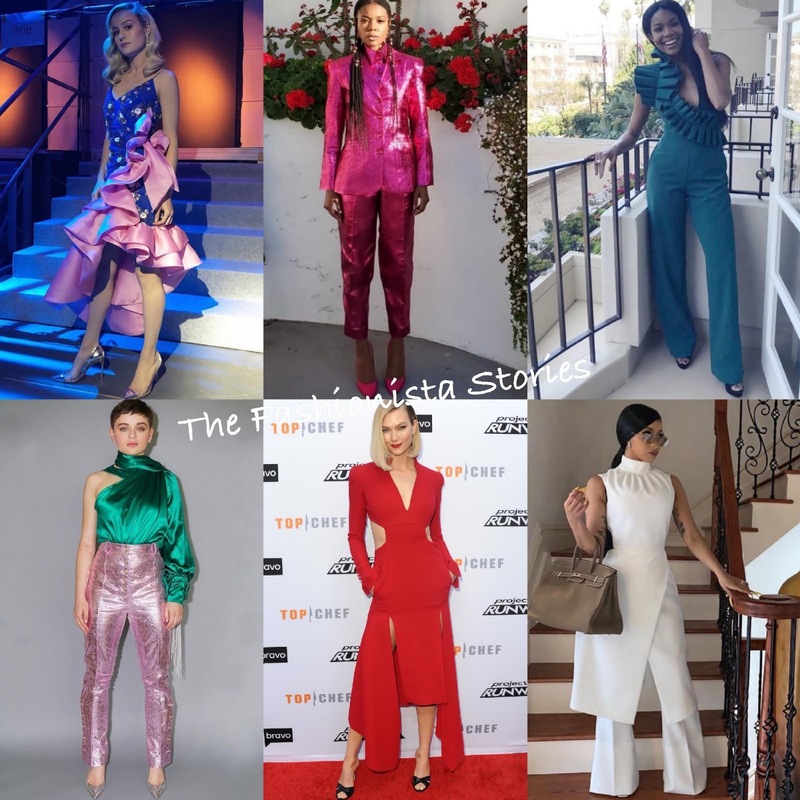 Who was your Best Dressed Celeb of the Week? Cardi B had to make a court appearance today(April 19th) in New York and she did so with style. She posted her stylish look to her instagram page. 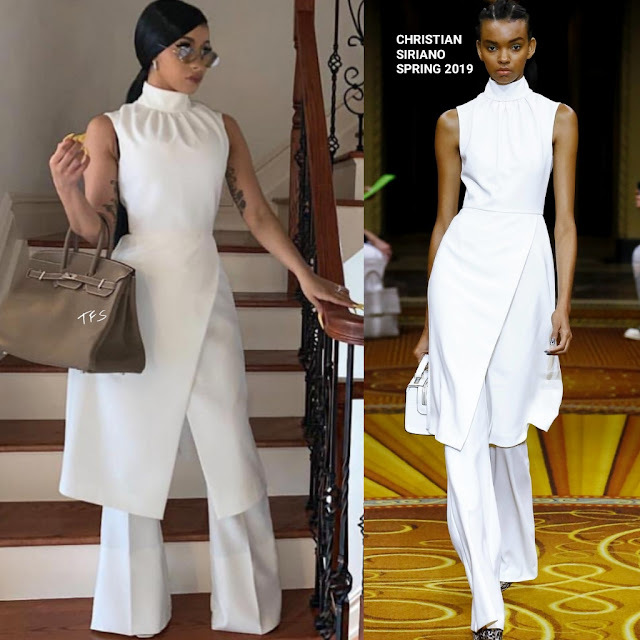 She posed for the gram rocking a CHRISTIAN SIRIANO SPRING 2019 crisp white ensemble which featured a sleeveless turtleneck, asymmetrical split crepe dress and the matching high-waist, wide-leg crepe trousers. Accessorized with clear DIOR sunglasses, a HERMES 'Birkin' bag, and SAINT LAURENT sandals, she finished up her look with a side parted ponytail. On the verdict of her style on this outing, I would say case dismissed because this is a win. Are you feeling Cardi's instagram style as well? Gabrielle Union and Jessica Alba has kicked off the promo tour for their new tv show 'LA's Finest' and they posted their promotional looks via their instagram page. 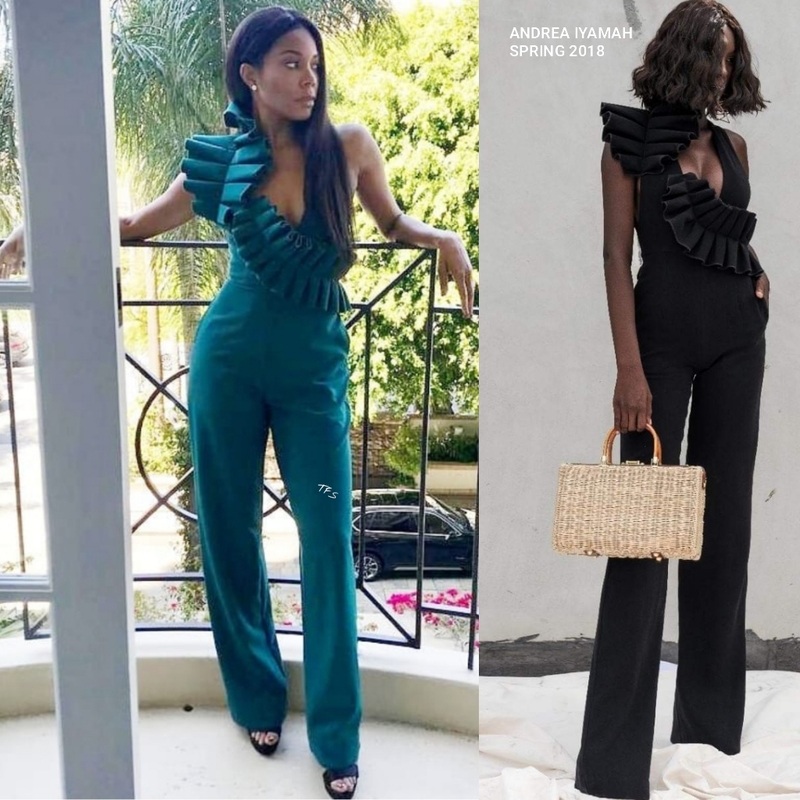 Gabrielle Union posed for the gram rocking the ANDREA IYAMAH SPRING 2018 'Iman' green ruffle pleated jumpsuit in green. While I love the fit of the pants on the model in the look book, Gabrielle still nailed her look. Although I wish the hair was in an side parted up-do. However I did see a pic with her hair off-the-shoulders. Yesterday evening(April 18th) the special screening of Netflix 'Someone Great' took place at ArcLight Cinemas in Culver City, California. It's stars Dewanda Wise, Gina Rodrgiuez & Brittany Snow were naturally on hand at the yellow carpet premiere. 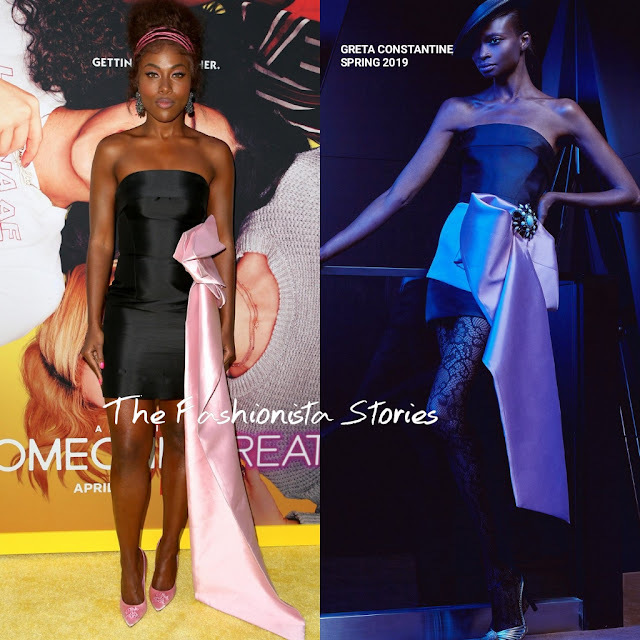 Dewanda Wise posed on the yellow carpet wearing a GRETA CONSTANTINE SPRING 2019 black strapless mini dress, featuring a contrasting pink draped bow on the side. The dress is given me a 80's prom feel and I find it to be a tad to tight on Dewanda. Also I prefer the look of the bow in the look book. BRIAN ATWOOD 'Pink as F$%k' pumps finished up her look. 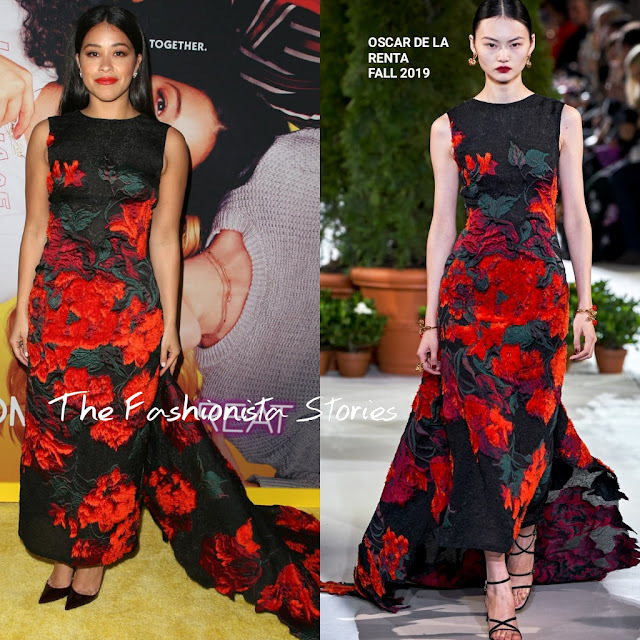 Yesterday evening(April 17th) the Apex for Youth 27th Anniversary Inspiration Awards Gala took place in New York and in attendance was Olivia Munn along with Gemma Chan. 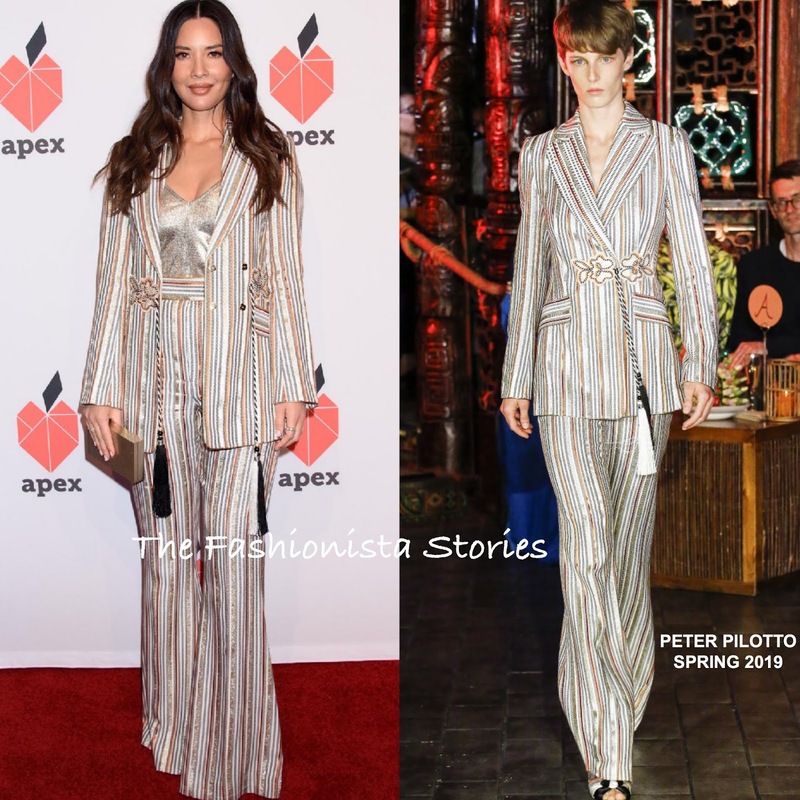 Olivia Munn who was an honoree, went the power suit route, wearing a PETER PILOTTO SPRING 2019 grey, white & gold stripe suit. Her blazer which featured a embroidered tassel waist, was layered with a custom gold LAURA BASCI tank top underneath. Center part waves and a gold box clutch rounded out her look. Alison Brie stepped out yesterday(April 17th) to promote her Netflix series 'Glow' and her stylist Erin Walsh posted her promotional look to instagram. She posed for the gram wearing an ISA ARFEN SPRING 2019 ensemble which featured a brown & black puffy sleeve, peplum top and a black see-through floral lace embroidered midi skirt. For coverage under the skirt, she wore black briefs. On the beauty end, Alison debut a new short blonde cut. Her flirty feminine and retro inspired look was topped off with SAINT LAURENT platform sandals. What do you think of Alison's instagram style? Michelle Obama across the pond, on the continuation of her 'Becoming' book tour, which is a NY Times best seller. Yesterday(April 16th) she made a stop in Paris where she discussed the book before a sold out crowd. 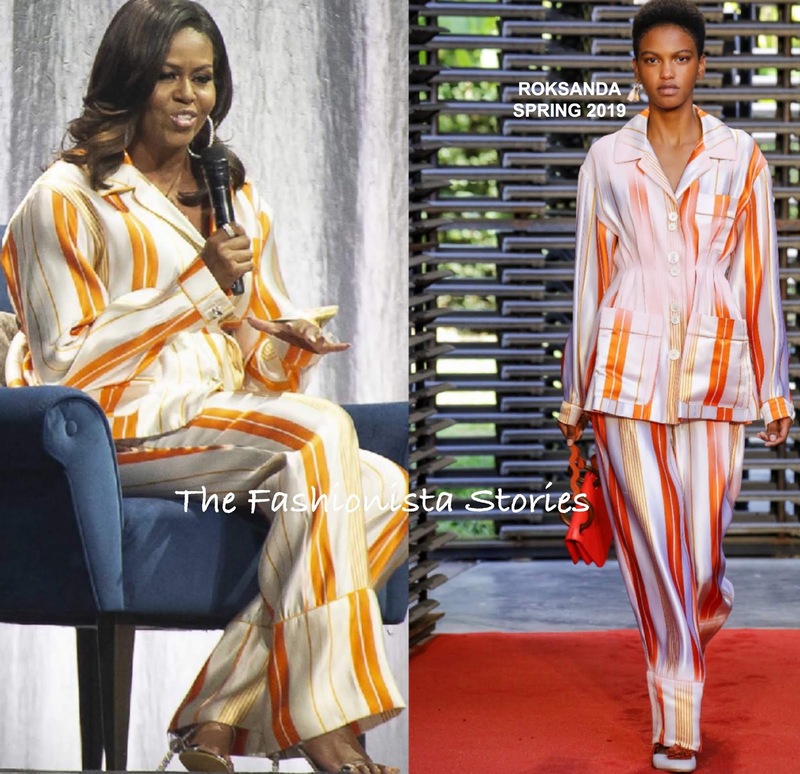 Taking on two trends in one, she wore a pajama inspired, power suit from the ROKSANDA SPRING 2019 collection. Her playful white & orange stripe suit was paired with SOPHIA WEBSTER metallic sandals. Accessorized also with sparkly diamond AS29 hoop earrings, she finished up with smokey eyes and side parted layered tresses. What do you think of Michelle's look?